Many UK photographers will know where this is. It is a much photographed landmark on the UK coast. Its something I photographed many years ago & I wanted to re-visit it to take some up to date shots. Some people think it difficult to photograph these landscape icons and think that they have to come up with something new. But there's no real need for that. Every shot will look different anyway, clouds etc will never be the same. I always tend to avoid looking at how other photographers have approached a location and just take the pictures I want to take. The top shot is a multi-image panorama. Interestingly in terms of the previous post and some of the criticisms of m4/3 in terms of dynamic range, this has been handled very well. I can't say for sure but the GH1 sensor does seem to handle this better than other m4/3 cameras which is good news for the ??GH2. The above shot is what looks like a memorial, though its not marked, the flowers are certainly not wild. These cliffs are certainly very dangerous and several people fall off and die every year. There was a wedding shoot happening on the beach, using the rock arch as a background. It was a fashion shoot with models and not a bride and groom taken to a scenic location after a wedding. 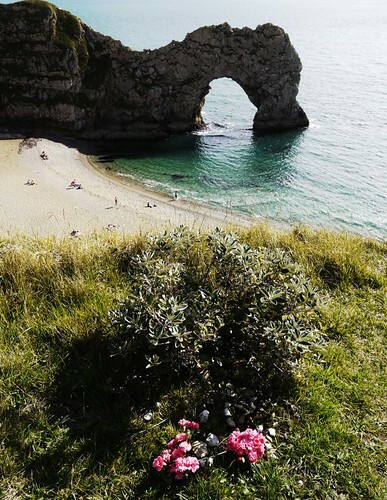 Anyone who's visited Durdle Door knows exactly how hard it is to get to the beach. They will also know how difficult it is to get back to the car park. I saw them later arriving back at the top, pulling trolley cases full of clothes, make-up and camera equipment and they all looked absolutely exhausted. I can only hope that they were all well paid! 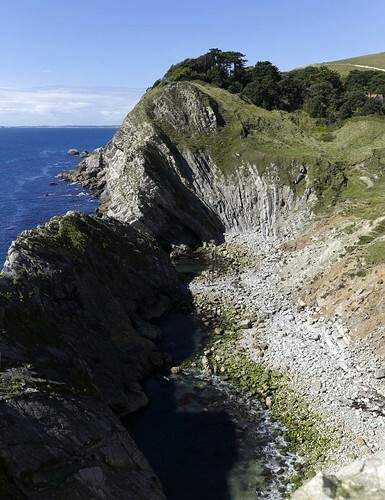 Earlier in the day I had been to those other heavily visited parts of the Dorset coast, Stair Hole and Lulworth Cove. For these images I chose to shoot multi image panoramic stitches on the Leica M9. This resulted in 150MB+ images of incredible quality. Capable of being printed the size of a barn door I imagine. So nothing fancy, no odd angles, no filters, just the pictures I wanted to take. I always try to approach these places as if I'm the first person to ever photograph them. Its simpler that way and I was certainly happy with what I got. We can all try too hard sometimes to come up with something different, instead of just relying on our own instincts. Photography shouldn't be competitive, though it often is. However I've long since given up worrying about coming up with "THE photograph" and just concentrate on taking pictures that give me pleasure to look at. I generally find thats a good start in producing pictures that might give others pleasure too.